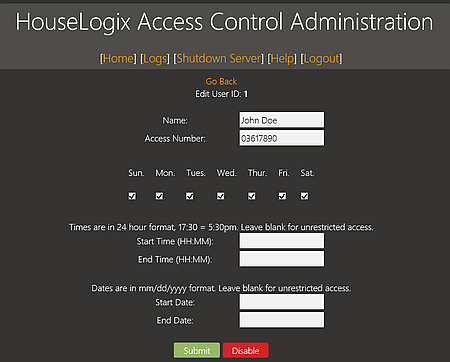 The HouseLogix Access Control Database (HACD) is the first driver of it's kind developed for the Control4 system; leveraging the power of Lua we have created a secure, easy to use, and fast graphical interface for managing users. Support for up to 500 users. - Add "Log" button to login screen to allow log viewing without requiring authorization. - Add "Database Title" property to allow for custom naming. - Add support for Dutch locale. - Adds support for French, German, and, Spanish locales. - Increase maximum users in database from 300 to 500. This driver is a user management warehouse - a central location to which card readers connect and check for user authorization. bind to this driver in Control4, and check for access. can then connect to this web server and can easily manage their access control system. Add this driver to your Control4 project. Add the appropriate card reader driver to the project, and bind it to the Database (this driver). On the Access Control Database driver, go to the Actions tab, and click "Start Server". you will be prompted to setup an account the first time you access the application. Log in, go to the Home page, and click "Add New". Enter the Name and Access Number for the new user. Ex: "John Doe", "123456789". You may optionally limit the days of the week, hours, and dates that a user is allowed access. Click "Submit". When card # "123456789" is read on the card reader driver, it will connect to the database, and check for access. If authorized, the database will approve access and log the time and date "John Doe" was granted access. Remember to stop/shutdown the server when you are finished with the application. This provides an added security layer. This can be accomplished by programming a custom button, or clicking "Shutdown Server" inside the web server application. For more specific information pertaining to the use of the access control web server application, see the Help page in the application. Shows if server is running or stopped. Port that the server runs on, default 8000. Optional admin username, if not set here, you will be prompted to create a username/password on first connect to server. Stop the web server. It is recommended to turn off the server when it is not in use. This can easily be tied to a custom button. Wipe out the current admin account, you will be prompted to create a new one on next connect to server. This event fires when ANY user is granted access. This event fires when ANY user is denied access. This event fires when a specific user ID is granted access. This event fires when the reader on binding # reads a card that is granted access. This event fires when the reader on binding # reads a card that is denied access. UserID #1 "John Doe" scans his access card/badge on Reader 1, at the Front Door. Event: "Access_Verified" is fired, and the lights in the building are turned on. Event: "Access_Granted_Reader_1" is fired, and the Front Door is unlocked via relay. Event: "Verified_User_1" is fired, and "John Doe's" favorite radio station begins playing in his office. Connects the card reader to the database.